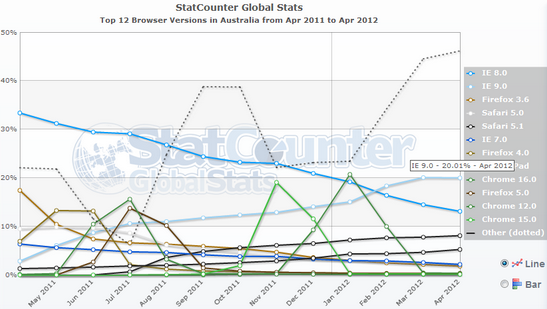 It seems as though Microsoft’s latest web browser – Internet Exploer 9, is growing market share in Australia. Comparing to Firefox, Chrome, Safari and Opera – this graph from statcounter.com as of May 2012, shows IE9 browsing (light blue line) at 20%. Also interesting to note IE8 is in 2nd place at 13%. With strong IE use on new Windows 7 PCs – this is no doubt a main driver of recent growth. It will be interesting to see what happens with Windows 8 and the whole new web browsing experience being offered.